What exactly is the HoloLens 2? Well, it uses a technology known as MR (Mixed Reality). MR is one of three main types of reality VR (Virtual Reality) Actual reality and MR. To really understand what MR is and how it is used we need to explore what AR (Augmented Reality) is. Augmented Reality is as it sounds, it is the process of augmenting the world around us using systems such as holograms a 3D projection that is intractable in the real world. MR is an upgraded and updated variation of AR. Applications of MR and AR have previously been exclusively used for gaming. As the technology progresses so does our ability to use MR in the real world for actual useful application such as architecture, construction, plumbing and electrical engineering. Now the return of investment would not be quite immediate unless you’re having people fly all around the world on a regular basis for business. 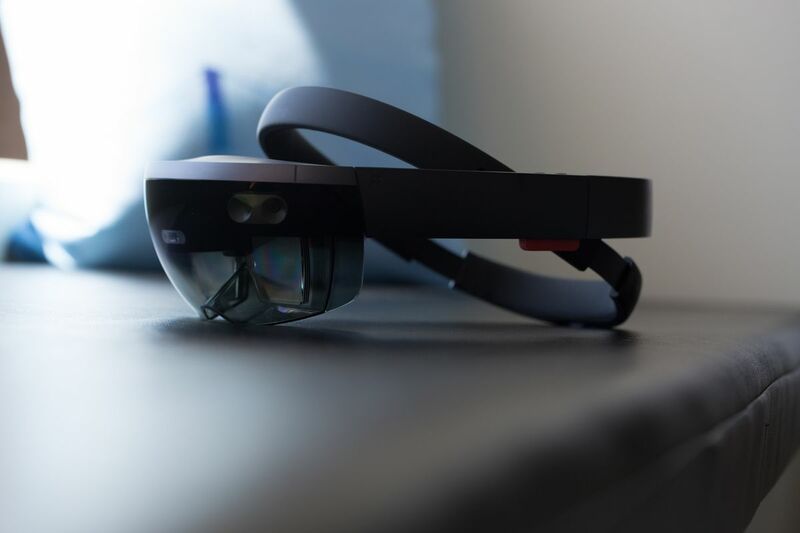 Say you’re using the HoloLens 2 for internal projects it will help productivity and allow a much more hands-on work ethic. Rising not only productivity but staff morale as they can physically and in real time see the fruits of their labour. Well, the HoloLens 2 is complex with its construction and proves that Microsoft is years ahead of the game with their technology in construction. The main glasses portion consists of two panes of glass and a membrane that reflects light from the laser projector directly into your eyes. With other competitors, this would mean each unit would need specifying to an individual user. Microsoft took their system to the next level by using two cameras mounted in the nose bridge of the glasses. These cameras point directly to the centre of your eyes sending the information to the membrane. So, the membrane knows where the centre of your eyes are so it can send the laser projected image directly to your eyes. The main body of the device sits around your head like a cap. With the batteries and main processing unit of the device at the back, this makes the entire unit feel level and lighter than the first generation. As for software, the device runs on an edition of Windows designed for the glasses which runs most standard Windows-based software. When you connect to a HoloLens world the world is persistent, meaning that even when you log off from the world everything stays as it was left. For instance, 6 users join a world where they are working on a team project to design a product and are demonstrating the latest iteration of the said product. All users log off but one notices a flaw in the device and leaves a note mentioning the flaw then logs off. When the other team members log back in they will see the note left by the other team member. The real-world applications of this are almost limitless. Say your setting up a new shop and you need to figure out a floor plan and have things prepared to be placed into the correct places. To maximise visibility and ease of access, you can use the HoloLens to place down the shelving units and display stands in places you think would be a good fit. You can visualise what the setup is going to look like or alternatively you could even use this setup to host a store. A digital store in an empty room allows people to come in and put on a headset and shop online. This would lower costs as the shop would not need products in the store. Products could be delivered directly to the customers meaning they won’t have to carry any actual products in stock. In the instance of a plumber, electrician or contractor they can go on-site and visualise the building plan using HoloLens 2. This will allow them to see through the walls and see wires or pipes allowing for faster access. Avoiding unintended and unforeseen circumstances saving not only time but money as well ensuring the job is safely completed the first time thanks to good foresight and planning. Implementations of this technology for businesses are endless but also for the education sector. We could implement this system to be used in schools and in training to teach and train others. Say you ran a flying school and you teach new pilots how to fly. HoloLens provides a cheaper, efficient alternative for building realistic simulators. You can just use the headset and open a simulation program that will give the user a realistic flying experience. This will allow for more training programs with an endless amount of simulations. This allows the user to practice a variety of scenarios such as landing a plane, crash landing, emergency landing and many other possible situations. Bringing the HoloLens 2 into the education sector and allowing students to use the device will undoubtedly increase the learning standards. Many students learn faster and retain information more while using hands-on learning. Subjects such as history or geography, construction and creativity-based subjects are examples where this device would improve learning. Institutions could use this device to help architectural students understand the fundamentals behind the construction. For example; showing blueprints of buildings in real-time or showing how the structural integrity can be changed by removing or adding supports. What does it cost? Well, the HoloLens 2 costs around £3,500. This seems like a large investment compared to other VR solutions. However, it has benefits of a mixed VR approach that other competing systems do not yet offer. It will save companies money in areas such as travel, accommodation, stock handling and education resources. The return on investment will soon be realised. Microsoft also offers subscription and trial offers.